An article published recently in Royal Society Open Science had some interesting things to say about thankfulness. They studied eight languages from five continents by examining over 1,0000 interactions of requests and responses of gratitude. It wasn’t just “Thank you,” that they were looking for. Even responses like “Sweet,” or “Great,” were taken as tokens of gratitude—”any positive communication of appreciation or satisfaction.” Their conclusion was that requests for help were met 88% of the timebut expressions of gratitude are very infrequent in all languages, occurring an average of just 5.5% of the time; less than one in ten. That’s about what we find in Luke 17:11-19. Jesus healed ten lepers who cried out for mercy, but only one of them returned to give glory to God and give thanks to Jesus. He had received his physical health for the rest of his life, and so, by returning he began a personal, eternal relationship with Jesus by faith. We follow Jesus, too, in giving glory to God for His mercy and giving thanks to Jesus for His love. 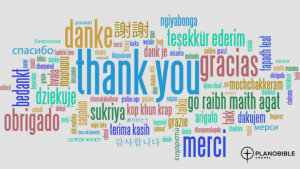 What is our GQ (Gratitude Quotient)? What keeps us from giving thanks? How do we cultivate a heart of thankfulness?